ROFL! Comedian Jack Carroll is declared funnier than David! 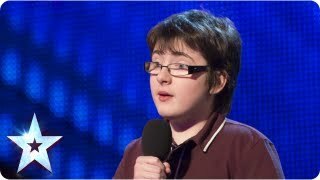 Despite fearing he was being thrown to the lions, teenage comedian Jack Carroll had the audience rolling in the aisles from the moment he stepped onto the stage. Check out why David pronounced him a "comedy genius" for his bold, brand of self-deprecating humour. [Bristol] Graffiti artist shows and explains some of his best work.